RadWizard for ASP.NET AJAX handles gestures from touch enabled screens. 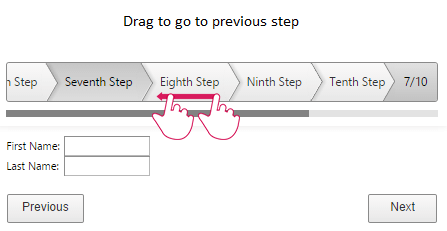 You can use the drag to perform scrolling between the wizard steps as shown in Figure 1. Figure 1 illustrates how to use touch device gestures on RadWizard. Figure 1: RadWizard handles drag to scroll between the wizard steps.